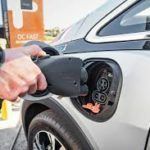 Local electric car enthusiasts will display their all-electric and plug-in hybrid/electric vehicles, answer questions, and get you revved up to consider if an electric car would fit into your lifestyle. They will discuss how EV’s are 10x cheaper to operate and 5x more efficient than gasoline vehicles, are better for the environment, reduce dependence on foreign oil, and are fun to drive. Expo is free. Bring friends. Questions? Contact Al Pugsley at apphs58@yahoo.com.